Bill Gullan: Greetings one and all. This is Real-World Branding. I'm Bill Gullan, president of Finch Brands, a premiere boutique, brand consultancy. And thank you for your time. Bill: Today is an interview with Bruce Williamson. Bruce is the Global VP of Innovation at the DRINKS division of Mars. Do a lot of incredible, innovative, super cool workplace coffee programs. He'll talk about that. But his career, beyond his current role, is amazing. Starting out in an engineering track academically. He'll talk about the sort of reasons why the light bulb lit up, and he moved in more of a strategic marketing direction. He's done a ton with innovation. Did more than a decade at Kimberly-Clark, both on the consumer side and then on what is known as the professional division of Kimberly-Clark, which is about deploying their brands in hospitality, and workplace, and health care, and other institutional environments. Bill: And then, the conversation. I think you should always stay till the end, but particularly stay till the end this time because we end with a conversation about a really interesting topic that Bruce has thought a lot about, and is actually writing a book about, and actively researching, which is business legacies. And they think he means it more than, you know, "An executive retires from a company after 30 or 35 years." It doesn't have to be that. It isn't just about gold watch time, but it's about how people have lasting impact, and are remembered for what they did and who they were. It's a topic that you haven't seen much about in the media, but it's super important, and as a sort of words to live by set of interesting ideas for one's own career development, I encourage you to stay till the end and hear Bruce's thoughts on legacies. Bill: So, without further adieu, Bruce Williamson. Bill: We are here in Finch Brands HQ, with Bruce Williamson, who's the Global VP of Innovation, and the CMO at Mars, the Drinks division at Mars in West Chester, PA.
Bruce Williamson: Yeah, thanks. Great to be here. Bill: It's our pleasure. And what a career you've had, across consumer packaged goods, and innovation roles, and marketing roles, and general management roles. And if you wouldn't mind starting by taking us through a little hop, skip, and a jump of the journey you've taken so far, Bruce. Bruce: ... of all things. So, I started off like many marketing folks, maybe not starting in marketing but starting in another career, which is, for me, engineering. I started off identifying the fate analysis through biodegradability, flush-ability of consumer packaged goods. Bruce: My time at Kimberly-Clark, you know, diapers, and tissues, and all kinds of stuff, and figuring out their impact for the environment. I spent countless years trying to figure out how to get something that's about a hundred times bigger than the size of the exit of a toilet bowl, down into the toilet, and to figure out where it goes in the environment. Bill: Obvious path to marketing from there, right? Bruce: Obviously a path to marketing. I figured I was a good engineer, but not a great engineer. But had this kind of burning passion inside me to say, "Strategically, how do we do things better?" Instead of just introduce new products, how do we position them? And I used that as a platform to go get my MBA at Michigan, and from there just spent a time over the last 10 or so years, sort of in front end marketing and front end innovation, coming up with white space opportunities on a number of Kimberly-Clark brands, and then new brands that we created, not only in North America but all over the world. Mostly focusing on insights, really, taking that clever thing that you can identify that the consumer gives you, that little nugget, and using that as a platform to do some great things. Bruce: Great to come back. Bill: ... to West Chester. Went for undergrad in Madison at University of Wisconsin, your degree is in engineering, civil and environmental engineering. Was there a light bulb moment where ... You said the engineering path, good but not great. Bruce: I think, for me, it was the satisfaction. I spent some really cool work with some scientists, doing, as I mentioned, some really interesting work. I mean, this is where the creative side of engineering came out, where I was looking at earthquake engineering, to get things to fold, and twist and turn, to get something really big down a smaller tube. And this was at the height of a lot of concern over environmental sustainability issues. When the market, or the consumer sentiment said, "We're not so concerned about these things," is when all the projects stopped. And I was a young kid who sort of said, "This is great work. Why aren't we commercializing?" And the perspective from the business was, "Well, it's not the right time and the consumer doesn't care anymore, therefore we're not going to work on it." Bruce: And I got frustrated. Bruce: And said, "There's gotta be a different way to actually take great ideas, and not just base it off the sentiment of the market, but actually do great things and use that as a platform to say, I want to do something different and I feel like there's a different way." Bill: ... some of these brands into ... We'll talk about insights. You used the phrase, "Insights led innovation." Can you tell us a little bit about just high-level, your perspective on core principles that drive great innovation programs, and maybe what the philosophy of, "Insights led innovation," sort of means in practice, or has meant for you across that journey? Bruce: Yeah, yeah. I think it's over-used nowadays, but I'd say in early days, empathetic marketing and empathetic insights was ... I would just say those early days, it was not quite in vogue but that was the way you got things done. I mean, we talk about it like it's second nature today. Bruce: But I know I was, based on my scientific background, really intrigued with how people decide what they do. And we use the term behavioral science today, but I think for me, first and foremost is, is using behavioral science, using a deep empathetic appreciate of the person, the why behind the decisions they make, understanding the insights behind the decisions, has really first and foremost, an interesting strategy, an interesting idea. Bruce: And not just listening to what people say, but watching what they do. So, quite a bit of time in the field. I often laugh about living with consumers. I'll never forget doing a project on cleaning of hotels, and practically living with some of the guests, okay? Bill: I'm sure they appreciate it. Bruce: …unpack your bags, get into the bed, obviously quote on quote, "Not with us." We want to see everything you do, and uncovering those really interesting quirks that people can't tell you if you sit across the table, like we are today, watching what they do. And having them, with social sciences, unravel why they're doing what they're doing. In some cases, it's unconscious. Bruce: Never get there. I'll give you a great story. So, we're doing this research on the hotels. We had two rooms that were set up almost identically, okay? And in one room, there was a big red wine stain in the center of the room. Again, both rooms almost practically identical. And there was a big red wine stain, but there was a check list that we put in the room that said, "This was the 10 things that the housekeeper did to clean the room." And all the things were checked off, and her name was signed. And we had people go in and out of rooms, and said, "What did you like, what you didn't like? What did you notice?" And invariably, almost everybody said, "I really thought the room ... " They never said with the red wine stain, but the one room with the red was always cleaner, always cleaner. Bill: Because of the checklist. Bruce: So, we said, "How come you didn't mention ... you mention all these things that you loved about how clean the room was, but you never mentioned this big red wine stand in the center." And almost invariably, everyone said, "Because we assumed that the housekeeper got on her hands and knees, and tried her best to get that stain out, because of the checklist." Bruce: And there was this moment of saying, "Nobody appreciates how the room is actually cleaned, what goes into cleaning the room, and we need to make that visible." Bruce: You can never get that out, sitting across the table and having a conversation with somebody. Bill: And saying, "Would you like a checklist? Does that sound interesting?" No, it's true. Nor probably will you get to that innovation, if it's a bunch of R&B or sort of navel-gazing folks sitting around saying, "How can we make the cleaning process better? Involving consumers to that depth, and their lives and stuff." Bill: That's a good segue. I know at a certain point at Kimberly-Clark, you pivoted to the professional side. You can tell us more about it, but sounds like the focus was hospitality, and health care, and other institutional sort of clients of Kimberly-Clark brands, like Kleenex, like Scott, et cetera. How was that transition for you? What was different, what was stimulating? Could you reflect a little bit on sort of what you found? Bruce: Yeah. I think it was probably the most fulfilling for me, because I think for the most part, B2B organizations, whether they're part of big organizations or they're independent, they're still very product-centric organizations, product marketing centric organizations, where you're still talking about features and benefits. And I think to carry the torch of brand-centric thinking, inside innovation, customer-centric innovation, to bring that into B2B was incredibly fulfilling, and has been in many cases transformational, not only at big companies like Kimberly-Clark, but at smaller companies. Bruce: I think, for me, it was incredibly fulfilling to just say, "What is the essence of brands, the essence of those insights, and how to bring it into the B2B world when you're two steps away from the end user?" And you're trying to convince a decision-maker that you assume is a functional, rational being, which turns out to be much more of a human appreciate. They're making decisions, some would say spontaneously and irrationally, but as everybody else makes decisions, very quickly, based on emotion. And I think it was only the light bulb going off, saying, "We need to treat the customer, the person who's making the decision of what to put in the washroom, as a person, not as a machine who just thinks about dollars and cents." That was incredibly insightful in almost every one of my engagements. Bill: Right. And I'm sure, to your point, that is a category, or a part of the marketplace, that maybe you hadn't always thought that way traditionally. Bruce: Yeah. It's, again, very product-centric, feature benefit centric. Bruce: Budget oriented. If you assume people are machines, if you give them X, Y, and Z. It fits within the bid, then you should get the business. And that's just, generally, a downward spiral, where it eventually becomes focused on price. Bill: Yeah, sure. If you're representing Kimberly-Clark and you're thinking about a long-term care facility, for example, or a chain of them, would benefit from having Kleenex versus another bathroom tissue, I'd imagine there's a blend of rational and emotional characteristics that would be important. Bruce: I mean, because Kleenex is a great brand. It means different things to different people, but it means care. To bring care into a hospital, a nursing home, a long-term care facility, instead of just something functional like wiping your nose, wiping your eyes, and make it mean something to people, and get the insights associated with that. Incredibly fulfilling. It's fun. Bruce: And again, you can get the connection between what the customer brand cares for, and cares about, which is not always about dollars and cents. Bruce: Obviously it's a business. They need to make money. And then, get that connected to the DNA of our brand. Incredibly fulfilling. Bill: Powerful stuff. So, to that end you've extended your passion for workplace, to your current role in the DRINKS division of Mars. You've, about two years at this point, been on that. Bruce: It was two years. Bill: What you found when you got there, and talk a little bit about how that market's different, or what you've experienced so far. Bruce: It's B2B coffee, which is fun. Mars is a great, family-oriented, family-run business. work, has been for decades. It's a fantastic organization. Bruce: But finding a product-centric, driven organization, again, transitioning to more of a consumer packaged goods, brand-centric, brand-led organization, was part of the heavy lifting I felt like I needed to do. So, carrying that torch of insights and not thinking about coffee and tea as something that's just provided to our office workers, is free. Bruce: And it's just sort of like, "Okay, well, it's free office coffee. The bar is low." That no one should complain about free office coffee. Saying, "It's more meaningful than that." Let's bring insights and let's bring the end user to bear, and illuminate for our customers the value of great office coffee. And it's been fun. It's been fun to really dig into clever insights and really reposition the role of office coffee for offices. Bruce: And I'm not talking about Google offices, okay? This is just mainstream offices saying, "A glass pot and office coffee's no longer the standard. We should be raising the bar for our employees." Bill: Mm-hmm, mm-hmm. Well, we are one of the beneficiaries of that, looking at this incredible apparatus that we have, as well as all the taste that it generates. What's the value proposition of a great coffee program, in just a normal office like ours? You talk about, obviously there's an employee engagement, happy, but maybe it goes beyond that. Bruce: So, we talk about this idea of the triple bottom line. Many people make decisions in the office. It's not their primary job. There's somebody in this office, where they're responsible for more things than just the break room and just office coffee. They've got a lot of things on their mind, and what they're looking for is this freedom to focus, and the freedom of focus evidences itself in one of the ideas of operational efficiency. The machine that doesn't break down, highly reliable. You often joke, when the coffee machine goes down it's like mutiny in the office. Bill: Right. Sure, sure. Like, "What the hell are they doing over there?" Bruce: You can feel the tension. You just look at social media images of what people say when office coffee goes ... you get the true nature that comes about with employees. I wouldn't say it's good. Most of it's bad. It brings out the worst in people. Bruce: But this idea of operational efficiency. You want the office coffee machine to be always working, always on, low hassle. Hassle-free, as we call it. And then there's the satisfaction of employees, which is another benefit. The person who's responsible for the office coffee wants a little bit of the accolades. You want to feel good about providing something great for your employees. You certainly get the brunt of complaints. But you want to get that bringing in something fresh and new into the office, and getting a little bit of a pat on the back. Because it often goes unnoticed. Bruce: And the last one has to do with sustainability, which is the third area of the triple bottom line. It's more than just providing great coffee to the workplace. There's other things that go into it, as we call it the triple bottom line. Bill: Mm-hmm. I think our team members here probably walk past, depending on their route, five, six, seven, eight, nine different places that they could get their coffee in the morning, yet I think increasingly, since we switched to this, they'll come here because they know that it's a great experience, and all the things that you talked about that go along with that. And I know from a company perspective, as we were planning our move and this was, everything has a line item, and we're sort of assessing the level of satisfaction, both for us and for the team, by investing in this line item or this line item, this was one that we really wanted to do it well and right. So, the effect hopefully is positive. It certainly is in terms of how it tastes. Bruce: Yeah, how it tastes, appreciate this, breaks matter. You want to have that break experience, those moments of ... We often talk about this idea of office workers now as corporate athletes. And so, between the sprints of work, you want to have that moment of rest, refresh, rejuvenation, and the break experience matters. Making sure you have what you need, a good, solid cup of coffee, a great cup of tea, and taking that back to your workplace and using it as a chance to reset, and just sort of prepare for the next sprint. Bruce: It's connection between people. Bill: Definitely. And so, as we move into a little bit of a retrospective discussion about your career and the choices you made. When you think about Mars and what you're working on now, it sounds like there's some product innovation and bringing brand, and bringing insights into the process, exciting things that are happening that you can share, or we'll just have to watch? Bruce: Well, we've got a lot of great product innovation. After studying office workers, I alluded it to the idea of the corporate athlete. What does that mean? Office coffee could mean something different for the people who consume it here, versus consuming it at home. What are those things that you need as worker? It may beyond just caffeine. So, thinking about other things that you may put in coffee or tea could have benefits to you, and what you need in the office, is one area. Bruce: I think from a process standpoint, we're really pushing on behavioral science, really understanding and getting into the nuances of why people decide what they decide. We call it persuasion science, or influence science, and understanding from an insight standpoint, how do we get deeper into those choices that people make? To be the first cup of the day, for example. Bill: You were very patiently listening when one of our colleagues came in earlier, as we were setting up, and talked about his 18-step ritual that is so idiosyncratic and unique to him, that I'm not sure there's so much you could draw, but I'm sure everyone has their own sort of rhythm of how to do this, and the degree to which what you all have delivered helps facilitate that, is probably a sign of success, I would think. Bruce: Yeah. What he described is what many human beings crave, which is a sense of control. So, this idea of choice and control. I want to be able to control what I drink, and that gives me the opportunity through choice to be able to put my own concoction, my own customization together. And I think that's one of the advantages of our platform. But just from an inside standpoint, understanding that people really crave control as human beings, and figuring out no matter what your platform is, no matter what your product system is, how do you give people that sense of control? Bill: Sure, sure. And speaking of your own personal concoction, you've taken us through what has been an amazing string of roles and responsibilities across this career. You had a big sort of switch moment early on. Any words of wisdom, or principles that have served you well across this incredible career that you've built so far, that you'd want to share, that are important either beliefs or underlying rationale for some of the choices you've made, and directions you've taken? Bruce: Yeah. I'd say I'm a big proponent ... even though I’m still relatively young of legacy and thinking about what you're going to leave behind. And I've spent quite a number of years watching people leave organizations, only to have them forgotten the moment they leave. And other people, for whatever reason, still remember years later, still talked about in the office, still come up in meetings. And I want to understand, what was it about those people, versus the people who just walk out the door and people very quickly forget about them? Bruce: And there's actually a handful of components that I've identified the ABCs of legacy-building. The first is apprenticing. You're never too old or never too young to apprentice a colleague. And the number one thing that people remember of those folks that leave an organization, is what they helped me be better. Did they help me be better? And you don't have to be a leader to do that. You can be just a great colleague that helps somebody be better. That's the first thing that people remember. Did you apprentice me? Did you grow me? Am I better because of you? Bruce: The second is boldness, and there's a courageousness, a bravery with certain decisions, and certain pushes that certain leaders make in organizations that are unforgettable for colleagues. So, are you able to push the boundaries of an organization in a collaborative and respectful way, and help us to be stronger so we look back after the years and say, "I'm changed. I've been through a transformation"? Or you've helped lead an organization through a transformation. So, those elements of boldness. Not always in the swing for the fences type decisions, but we're all faced with bold moments on a day-to-day basis. Bruce: The third is connection. That's the C. A deep connection between people, and that shows up for many leaders and many people in authenticity, vulnerability. Having the ability to connect with people at a very fundamental level, so they get to know you and they get to know the mistakes that you've made, and you've learned from your mistakes, and share your values, your character, the choices that you've made. Bruce: And the last, the S, is stories. Bruce: I’m a big proponent of story-telling. So, the things that people remember in organizations are often told in stories. Anthropologically, we're wired for stories. 40,000 years ago, we found in caves drawings by the early cavemen, they were speaking in terms of lessons learned of fighting the wooly mammoth, okay? In terms of stories. The great floods, and moving entire communities, were painted on caves because they were the stories that they were telling, and they were the lessons that were passed down from generation to generation. So, great legacy leaders tell great stories, and remember them in stories. Bruce: And it's through the right crafting of a story, the right crafting of a narrative, and there's a little bit of a science behind it. I mean, social sciences have taught us what it means to have a great story. The “is”, and the “could be” moment. The gap between the “is” and the “could be” is what really captures the imagination of audiences. And I think great storytellers do a great job of stretching that gap, and that expectation on where we are today, versus where we could be, and pulling people in that direction. Bruce: Yeah… associated with apprenticing, boldness, and connection. They remember those are the elements, but they remember them in stories. Bill: In stories, yeah, and in episodes. Bruce: My encouragement for people is just, at any given day, any given moment, you have that opportunity to think about, what can I leave behind? What can I leave behind to a client? What can I leave behind to a coworker? In those moments, not just those defining moments that we're faced with. Sometimes, a couple times in our career, sometimes never, but those small moments that you can put in your pocket, your colleagues or clients can put in your pocket that are incredibly meaningful for them. Bill: This is really deep and powerful thinking. You going to do anything with it? Bruce: Yeah, I know. I've got a manuscript that's ready to go out the door. Don't expect to do great things with it, other than get something I'm super passionate about out there. Bruce: Well, look. There's a biological base for it. So, neuroscientists would say we're wired for stories. When you tell facts or figures, only a few parts of your brain are lit up. When you tell stories, up to seven parts of your brain are lit up. It goes into the deep recesses and your muscle memory comes back when you think about stories. So, we are captured, our imagination is captured in stories and we remember in stories. There's a biological basis for it, okay? It's hard to remember the data. It's much easier for us, biologically, to remember stories. It's apropos for brand storytellers, for business storytellers, and for any leader to use story as a way to carry legacy on in an organization. Because it's easy for us to remember that way, and it's brought forth in our memory in a much easier way when we think about it. Bill: Mm-hmm. It's super powerful. And so, that sort of construct is words of wisdom, not only as people consider the choices that they make along the way, but how they leave something behind, how they have an impact on others, how they seek their own sense of meaning and purpose and value, as their careers develop. Bill: Bruce Williamson, thank you so much for your time. Bruce, as noted, is the Global VP of Innovation, Chief Marketing Officer of Mars Drinks. We'll be looking for great innovations in the drink portfolio, as well as all that you're putting on paper about legacy. Thank you so much for your time. Bruce: Thanks, Bill. Thanks. It's been fun. Bill: Thank you to Bruce. What an interesting set of topics, not only in terms of his career journey and thinking about legacy, and the power of story, and so much that he's experienced and has studied. Great insight from a really, really strong and compelling professional. Bill: And as an interesting post-script to this story, at least to parts of the story, it was announced the beginning of October, I guess, October 1, that the DRINKS Division of Mars, where Bruce has been plying his trade, will be acquired by the Italian coffee maker. The deal was around 650 million, including some debt, and really a specialist in coffee, and it'll be interesting to see. 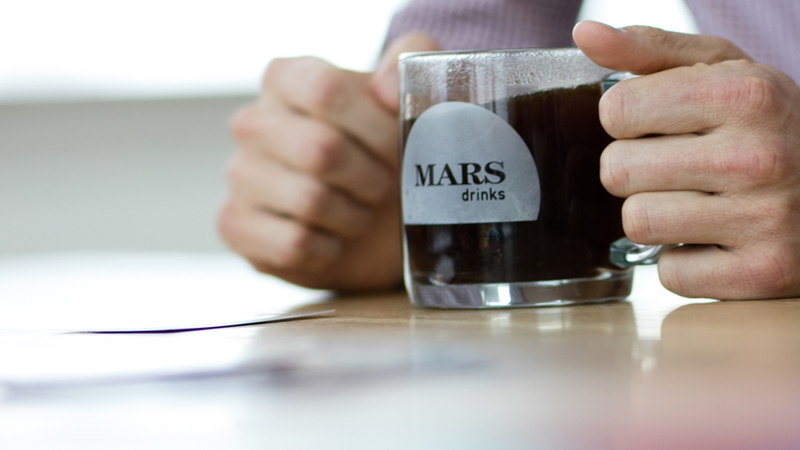 Mars obviously has a lot of capabilities across the confections business, and in coffee, too, but it will be interesting to see what the future will hold. Hopefully at the very least, Bruce and team will have some wonderful opportunities to travel to and from Milan, as they sort out what the entity will do, and will be, and how it will work. Bill: As always, there are ways to support us here at Real-World Branding. We love a rating if we deserved it. Five stars. Give us some comments on the platform of your choice. Get in there and rate us. Also, click the subscribe button. That'll make sure you don't miss a single episode every week, or every other week, as we're going to keep doing this through the fall and into the new year. Subscribe to make sure you do not miss a one. Whenever these episodes are uploaded, they will be downloaded into your device of choice. Bill: And then, let's keep the conversation going on Twitter @BillGullan, or @FinchBrands. Those are the easiest ways. We love ideas for future guests. With thick skin, we love feedback. Pro, con, as well as suggestions for how to make this of consistently greater value to you, our loyal listener. Thank you all. Have a great week, and we'll sign off at the cradle of liberty.